In addition to the medications I shared on my 10 Must Have Goat Medications post, there are also a few supplements and nutritional support items you should always keep on hand if you are a goat owner. 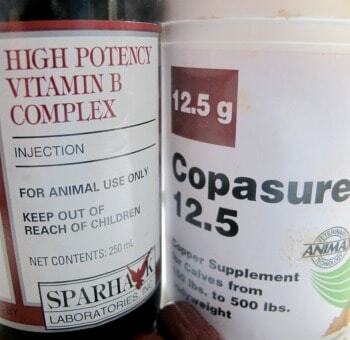 These are vitamins and other nutritional supplements for goats that either need to be made available at all times or used when you see signs of deficiency in your animals. Just like humans, your goats need to take their vitamins and loose minerals are the best way to get those vitamins into their bodies. These loose minerals should be offered free choice and available to your goats at all times. Goats are notorious for stepping in or otherwise soiling their food or hay, so be sure to offer the minerals in a way that prevents soiling from happening. You can make your own feeder out of PVC or buy small mineral feeders. Be sure to look for a complete formula that contains all the essential nutrients- and also make sure your minerals are labeled for use in goats and not sheep. Copper is essential in goats and sheep cannot have copper. Baking Soda, or Sodium Bicarbonate, is another nutritional support that should be available to your goats free choice at all times. We buy a big bag at our local feed store to keep on hand in a large can in the barn. 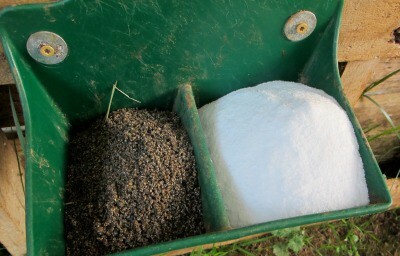 It can be used for all sorts of things- on the farm and in the house- and we keep it next to the loose minerals in our double compartment mineral feeders. Baking Soda aids in your goats digestion and helps to prevent bloat. They will only take as much as they need, when they need it. If it starts to look old, just sprinkle the old stuff on the barn floor and replace it with new. 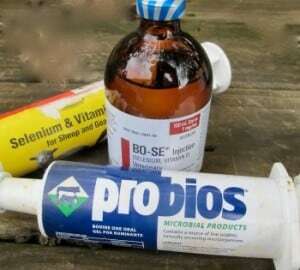 Probios is a probiotic that is good to use to keep your goat’s rumen running smoothly. It is full of beneficial bacteria to help start or recover good rumen function. We give every kid born on our farm Probios at about 3 days of age to jump start their rumen. We also dose our adult goats when they are sick, after antibiotic use, or when they are transported for any reason. Selenium is a trace mineral that is present in the soil. If you live in an area that is deficient, chances are your goats will not get a sufficient amount of this mineral and become deficient. Soil is considered deficient when there is less than 0.5mg of selenium per kg of soil. (If you would like to know about your area, here is a map of the selenium levels in the US). Selenium is an important mineral for reproductive health and proper muscle function. Read more about Selenium Deficiency. Last year we had one of our new does give birth to triplets, one of which couldn’t stand due his ankles bending backwards. This white muscle disease is the most common signs of selenium deficiency in kids. Adults can show signs of deficiency by abortions, stillbirth, or inability to conceive. We give our adult does an injection BoSe, which is available by prescription only, about a month before kidding. We also give BoSe to any kids presenting with White Muscle Disease. We also keep a Selenium/Vitamin E gel on hand which we give everyone at the beginning of breeding season. The margin for toxicity is small, so make sure you dose correctly for your goat and check that you are in a deficient area first. You can also try the new Bite Me! Goat Treats. The Mineral Mojo Bites are specifically for mineral deficiencies like these- an the goats LOVE them. I’ve spoken about Nutri-Drench before and it is probably one of my most used supplements. It is simply concentrated vitamins and minerals that are readily absorbed for quick energy. I give it to any goat that just seems off, recovering from sickness, and young kids and newborns (like my little one with white muscle disease) to help them have the energy to eat and grow like they are supposed to. Sometimes it can be the very thing to help a sick goat make it through the night and get on the way to recovery. Copper is another mineral that is essential for your goats. Copper is usually added to their feed as well as in their loose minerals. Even with these fortification most goats will need supplementation in the form of a copper bolus. Copper deficiency can cause poor growth in kids, poor coat quality and less resistance to parasites. One of the telltale signs of copper deficiency is the “fish tail”- when the hair at the end of the goat’s tail has split into what looks like a fish tail. We’ve used a product called Copasure. Ours is for cows, so we split open the capsules and dose the goats for their weight- putting the copper rods in their herbal worming balls. Another good product is UltraCruz Copper Bolus for goats. It is measured for adult goats so be sure to make changes if you are dosing younger or miniature goats. The B Vitamins are made inside a healthy goat’s rumen everyday. When they are sick or rumen function is compromised because they are off feed you will need to supplement their vitamins with an injection of the B Vitamins. Vitamin B12 is very helpful in goats suffering from anemia or recovering from other illnesses. Vitamin B1, or Thiamine, is necessary for metabolism and neurological activity. And is one of the only things that will save your goat if they come down with Goat Polio. Thiamine deficiency can cause many life threatening conditions, so it’s good to keep a Fortified Vitamin B Complex on hand at all times. We use an injectable formula from Southern States but there is also a paste that can be used for less severe conditions. An iron supplement is a must have when you own any livestock. Whenever you are dealing with a goat with anemia you will want to help keep them going by giving them an iron supplement as they build up their red blood cell count. We keep Red Cell on hand and our goats take it pretty easily. You can also purchase iron pellets or injectable iron supplement. Again, please make sure you use the correct dose for your goat’s weight. I am new to having goats and I just noticed that one of my goats has what looks like pink eye, can you recommend some sort of treatment? Could this be from a vitamin deficiency? and is it ok for goats that are housed with cows and horses to have minerlized salt blocks? I’m not sure when you wrote this, only shows a time, no day… anyway. I always use Camomile tea bag soak for pinkeye, with kids or animals. You will be amazed how quickly it heals. Just make yourself a cup of tea, and apply the bag to the eye. You can tape it there for an hour, or as little as 15 min. Do this 3 times a day at 15 minutes, or once for an hour. In two days it should be gone. I think it goes without saying, but allow the bag to cool to warm before applying to eye. Colloidal silver! I cannot say enough about this. It’s like a natural antibiotic. You can add it to a spray bottle/mister and mist it into the eye. For use in the eye though, only apply for 2 days in a row. No more. You can even apply this into livestocks drinking water. My toggenburg goat and thoroughbred horse are best friend. They eat together, sleep together and go around the paddock together. If my goat is concerned when my dog goes for a walk with me around the paddock, she goes over to the horse, sometimes under the horse’s stomach and feels safe. They are inseparable. They share a mineral block with the cows. Sometimes a lowline gentle cow sleeps in the large shed with them. The floor of the shed is fine wood chips. They love it. I have a spray ‘Terramycin’ for pink eye for pigs. I use it on any injury on chooks, ducks, cows, dogs, horse. Great antibiotic stuff for injuries. I would think it is used on any pink eye. Other than that, Orbinon eye ointment is used by my friend for his Angus beef cattle. I have also used it on my other animals. A vet okayed it for me. I do not use these things haphazardly, I ask a vet and if they are not solely on selling their own products, they will advise me. Could be tapeworms. Milk tapes. We have found that whenever a bottle fed kid stops drinking, it has always been tapes. my goat twinkles around its neck all the time,the neck goes right ,left,up and down.The strange thing the feed intake is normal. My young lamb goat is vomiting a white thing. What could be the cause? Can you describe it more? Is it like froth? Goat blocks do not have sufficient copper levels for goats,loose minerals are best.black oil sunflower seeds will help put weight on your goat and also improve there shiny coat. I have a sweet newbian girl I have just aquiered this last week. Her owners were less then upfront with us. We aquired 6goats in total. Before we got home we could tell there was an issue. By the next day we new we had a bloated goat and I was certain a respetory infection as well. It was labor day weekend and so we had a vet do an emergency run to our place. Come to find out I had two goats with respetory infections and only one showed the signs. We had all checked and sadly the one we had no idea was I’ll we lost that night. The one we knew had issue is still with us and was also choaked possibly from the infection. She is now near over this how ever if she eats anything outside the small pellet oat for goats mix I give her in rations she gets choked by night and we have to flush her. We have just started this new homestead she is sweet and relitively normal other wise. Sorry for the long story this has been a very laborious and expensive endevor for us. My question is what can I do for her to keep her wall fed and happy. When she can not do as goats do at least not yet. I hope this is a temporary thing while she recovers however I know it may not be and the isea of putting her down for this seems barbaric. I know they need a oats but limited she can’t eat pasture grass hey or anything of the sort. Please suggestions would help. I am starting them on some fermented grains as I do my chickens but she needs more. I have tried alpalfa pellets in small ration and she hasn’t seemed to choak, but is it enough it doesn’t seem so. Though she isn’t week and acting malnurished. i want to know how to wean them I take them away from the mother for a month or more when put back together to run they still go to sucking and she let them. Some take longer than others. We have had does that are like that- who will take back their babies after months. And others who wean their babies themselves. You may just have to separate them until the mom is dried up. I am new to Goats. Is there a feed with all or nearly all the vitamins and minerals needed? All this mixing and adding seems overwhelming. I have been feeding a goat sweet feed that says it has all it needs. And added pellets for goats They have pasture. But don’t seem to like grass, just the weeds. Should I still do the baking soda and mineral salts? I live in west Tn. Will do what I need to keep all 5 healthy and happy. Can recommend a video or information on hoof care. They look ok, but want to keep on top things. Thank you P.S. I do have a goat farmer that will give me information too. You need to keep loose minerals out for the goats at all times. get up laying on its side with a stiff neck. Can anyone help me on this ?